Joining with Christina and Creating my own garden of the Hesperides, I’m pleased to showcase fab foliage for May from my garden today. We’re water-logged here in Central Texas and while I’m appreciative of the rain, I wish it would stop. Or at the very least, slow down a bit. My soil is heavy and wet, but my plants are happy. 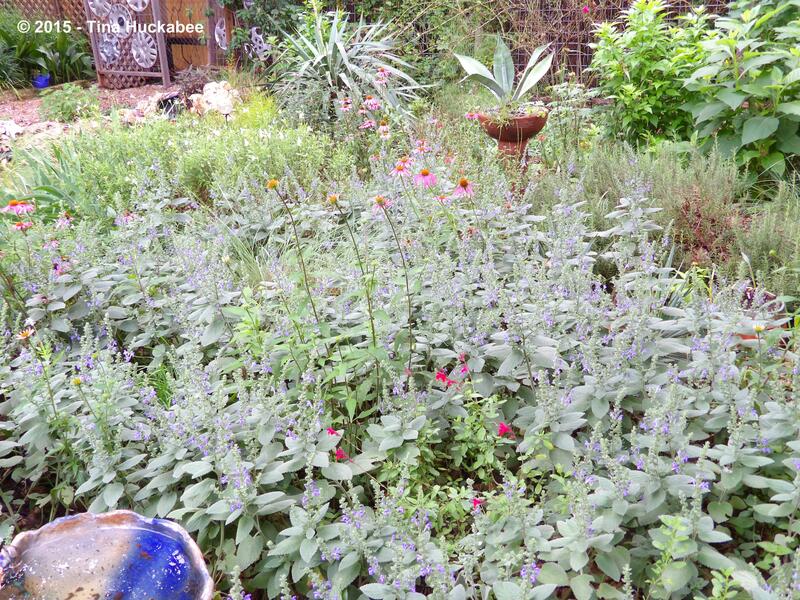 What I grow in my garden can take the extremes of Texas weather: from scorching hot, bone-dry summers to frog-drowning floods. 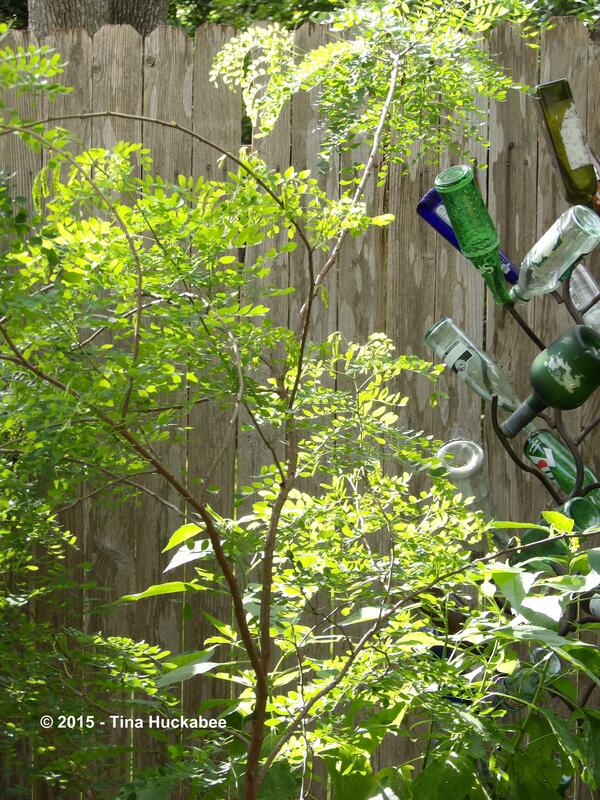 Texas gardeners live with anything and everything. The late May star of my back garden is the Heartleaf Skullcap, Scutellaria ovata ssp. bracteata, a cool season perennial which does spread. A lot. But I love this groundcover. The flowers are a stunning violet-blue, appreciated by pollinators, especially bees. 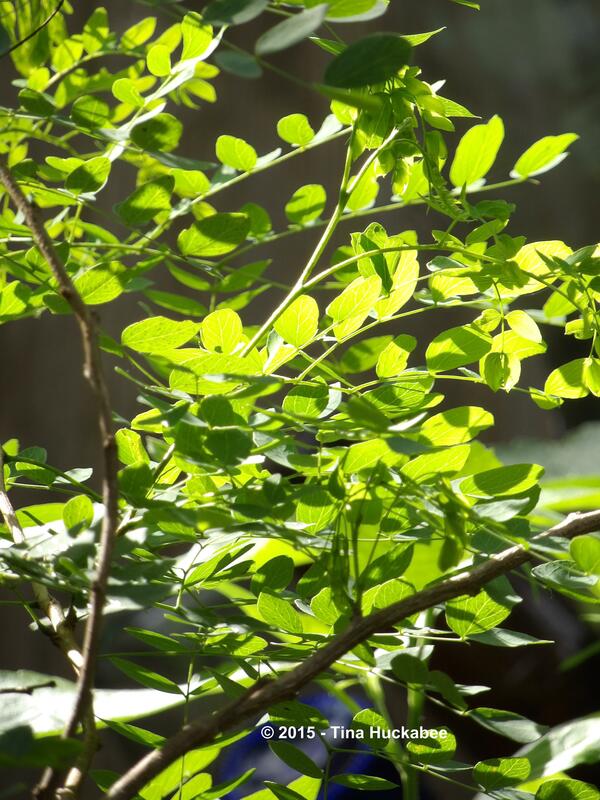 Its foliage is soft and beautiful–to view and to feel. 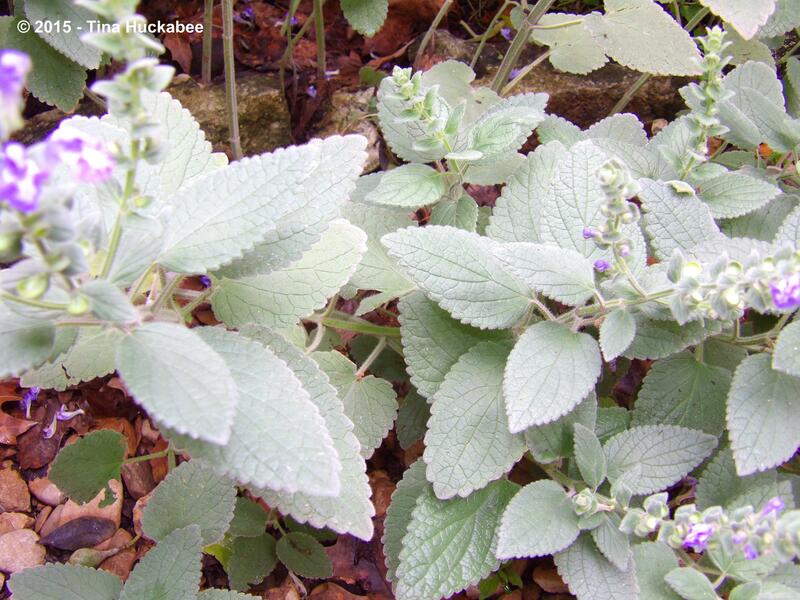 An attractive gray-green, the leaves are thick, soft, and scalloped, while set opposite one another along a hairy stem. Heartleaf Skullcap foliage is nice to touch, but imparts a slightly sticky residue and this trait is (supposedly) what makes it unappealing to deer. The bit of icky-sticky left on my skin when I pull up the plants at the end of Skullcap’s growing season is its most objectionable quality to me. 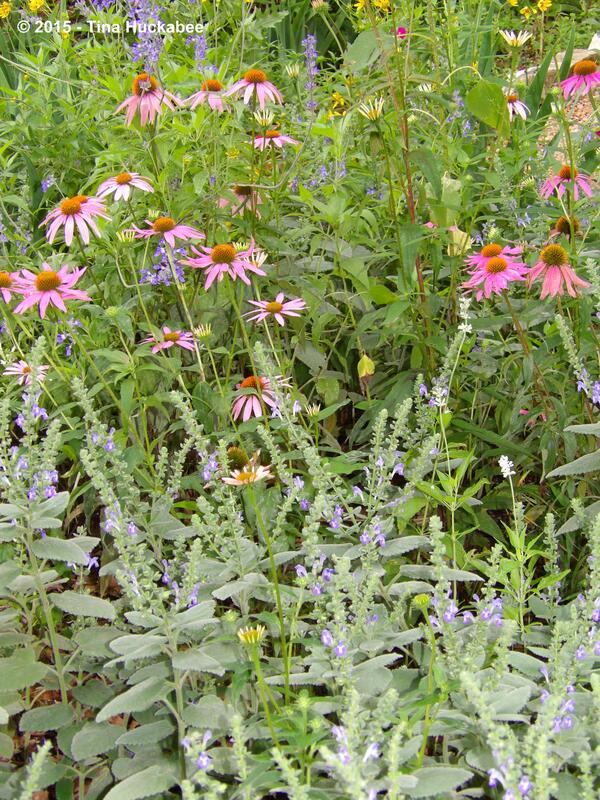 Skullcap is a favorite of mine: it waves a fetching blue/gray throughout spring and early summer and combines beautifully with many other perennials, each with their own interesting foliage. 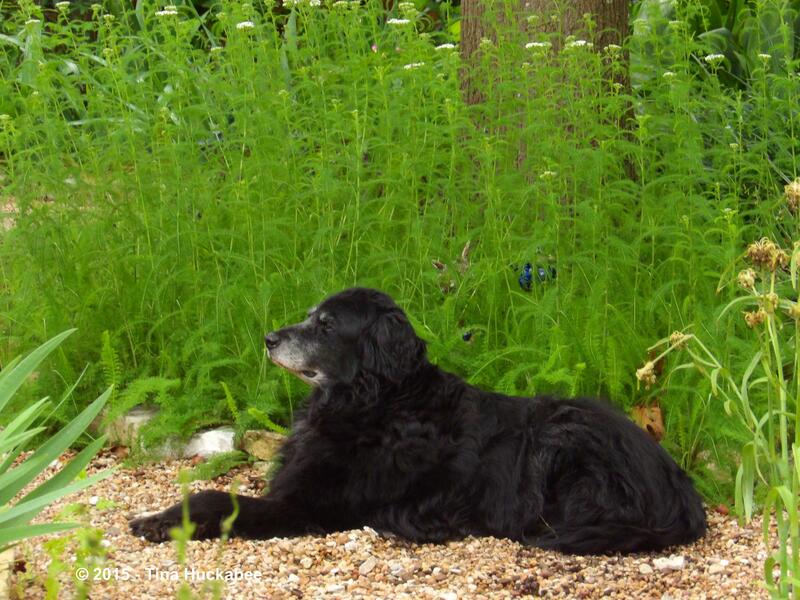 …and the maiden–grassy Miscanthus sinensis ‘Adagio’. Hiding underneath the Skullcap is a clump of Kelly green, aromatic, and fleshy Garlic Chives, Allium tuberosum. 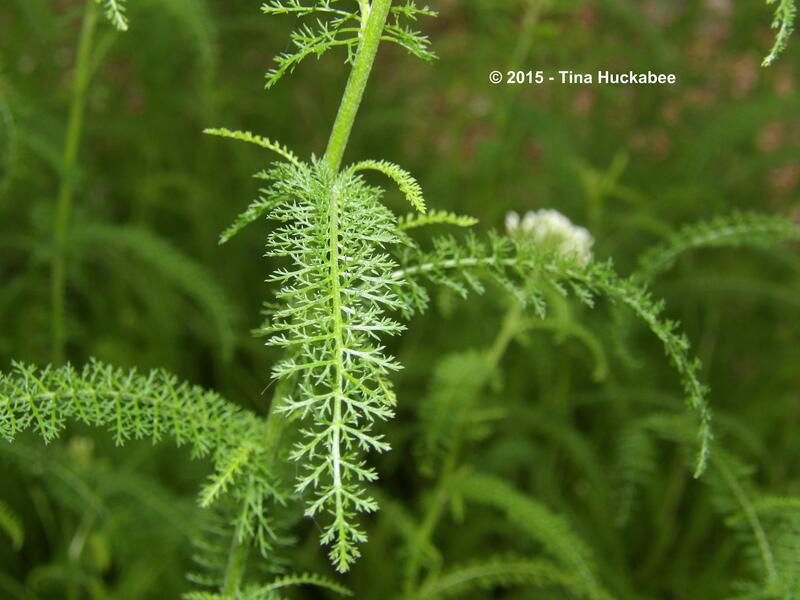 A brighter, lacy green is found with Common Yarrow, Achillea millefolium. This stand provides a nice backdrop for the Protector-In-Chief. Doesn’t he look happy and content? 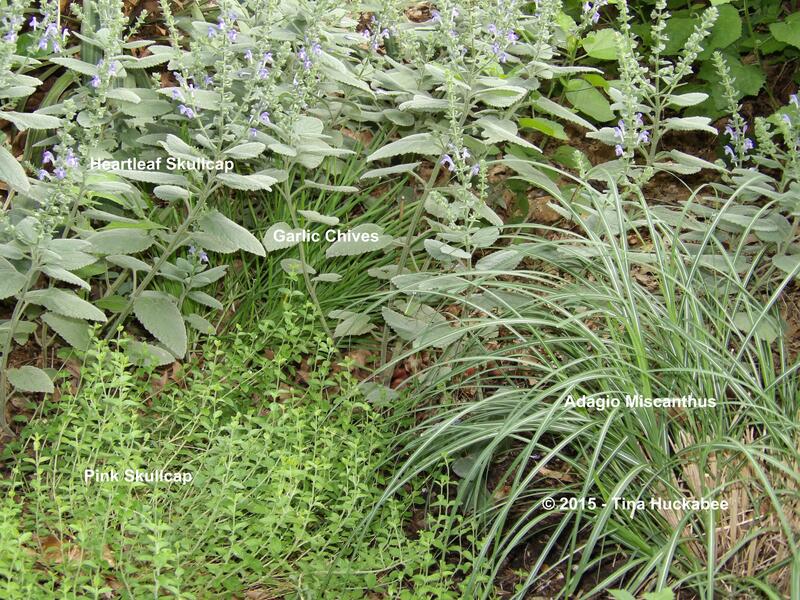 This fun grouping fills in the northern, shady border of a little back garden bed. It’s a mixed-bag of foliage characters, including white-stripey Dianella/Variegated Flax Lily, Dianella tasmanica ‘Variegata’, Katie’s Dwarf Ruellia, Ruellia ‘Katie’, and Columbine, Aquilegia. This particular Columbine is one of the natural hybrids of my A. canadensis and A. chrysantha. Photobombing on the far left is a containerized Yucca filamentosa, ‘Color Guard’ and some Iris straps, and spreading its succulence in the remainder of the bed is a creeping Sedum, probably Sedum diffusum ‘Potosinum’, though it’s a passalong to me from a friend, so I’m not positive of its identification. Isn’t Columbine foliage pretty? Especially so, when adorned with raindrops. 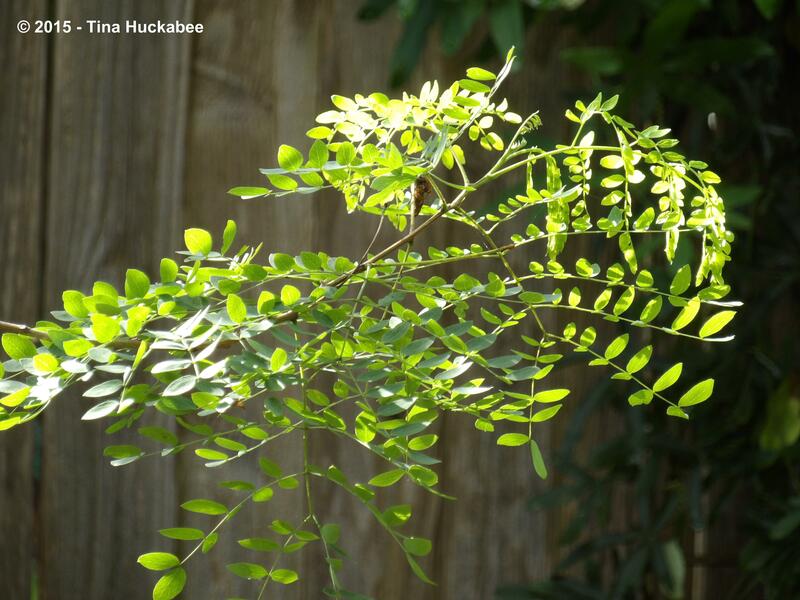 This young Goldenball Leadtree, Leucaena retusa, glows in the late afternoon west sun. Its fragrant, powder-puff flowers are done for the year, but the foliage will flutter in the breeze until the first hard freeze. The happy pairing of the structural and evergreen Sparkler Sedge, Carex phyllocephala ‘Sparkler’ and white-blooming, herbaceous Four O’Clock, Mirabilis jalapa, is garden serendipity. The ‘Sparkler’ sports jazzy stripes in the razor-thin leaves and paired with the Four O’Clock’s lush, smooth leaves–it’s a handsome combination. There are many shapes, sizes, and colors of gorgeous leaves in gardens–mine and others. 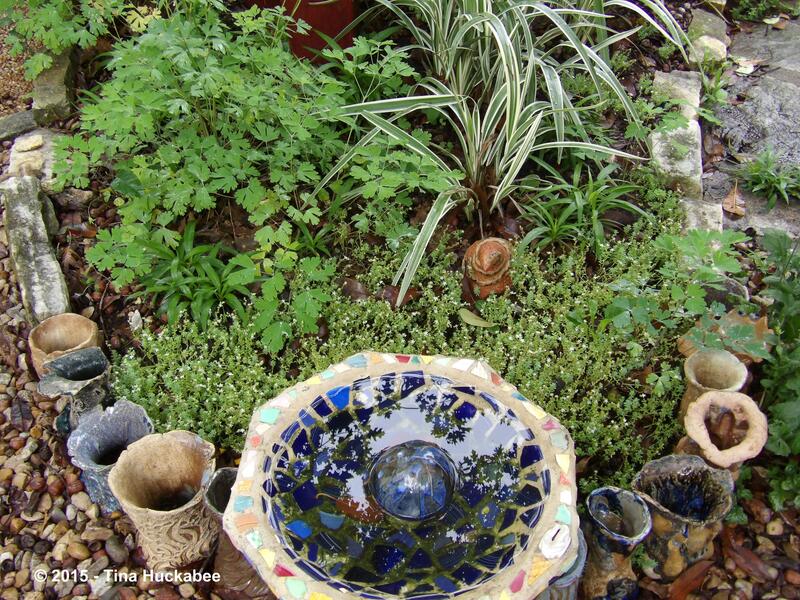 Take a look at the lovely Creating my own garden of the Hesperides and see interesting foliage from all over the world–and Happy Garden Bloggers’ Foliage Day! 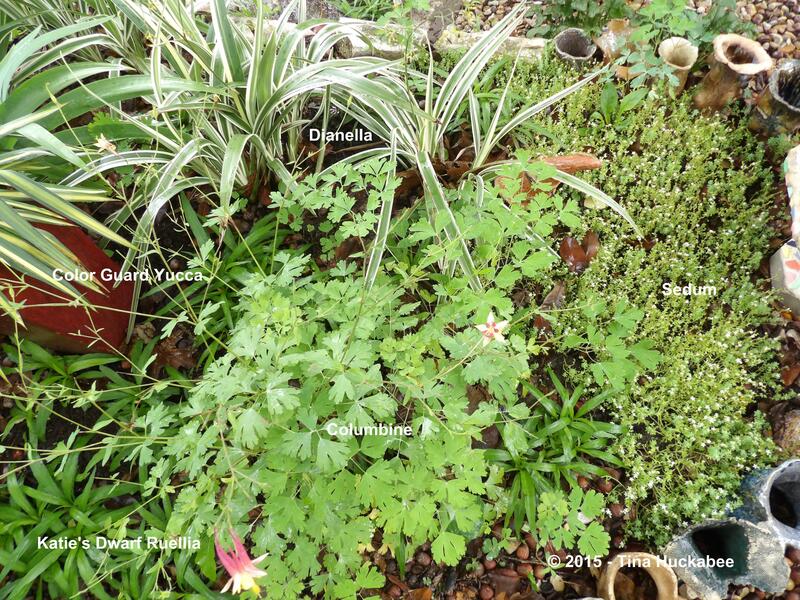 This entry was posted in Garden Bloggers' Foliage Day and tagged 'Color Guard', Carex phyllocephala 'Sparkler', Dianella, Dianella tasmanica 'Variegata', Four O'Clock, Goldenball Leadtree, Heartleaf Skullcap, Katie's Dwarf Ruellia, Leucaena retusa, Mirabilis jalapa, Miscanthus sinensis 'Adagio', Pink Texas Skullcap, Scutellaria ovata ssp. 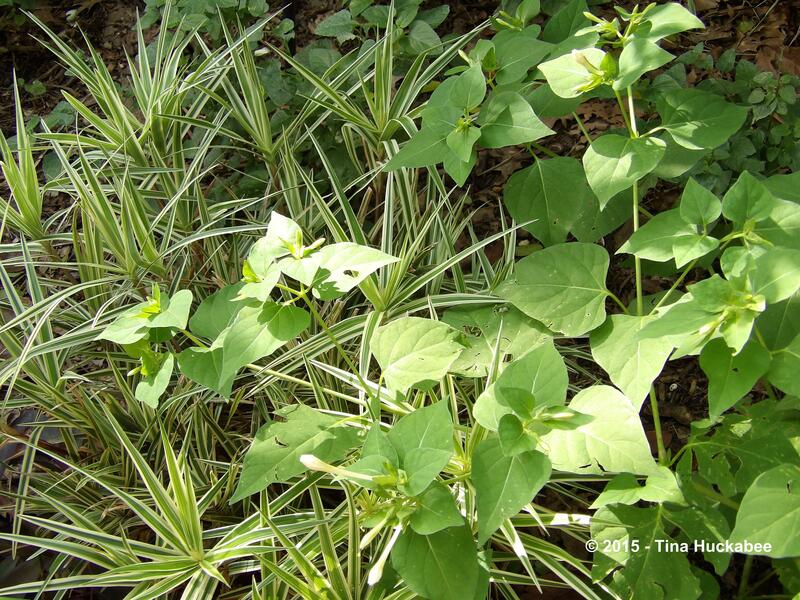 bracteata, Scutellaria suffrutescens, Sedum, Sedum diffusum, Sparkler Sedge, Yucca filamentosa by Tina. Bookmark the permalink. After reporting to you that the deer had been munching on the passalong heartleaf skullcap you shared with me, it now seems they are leaving the rest alone. Perhaps some young inexperienced browser tried it out – perhaps it reflected some doe’s attempt to satisfy a pregnancy craving? 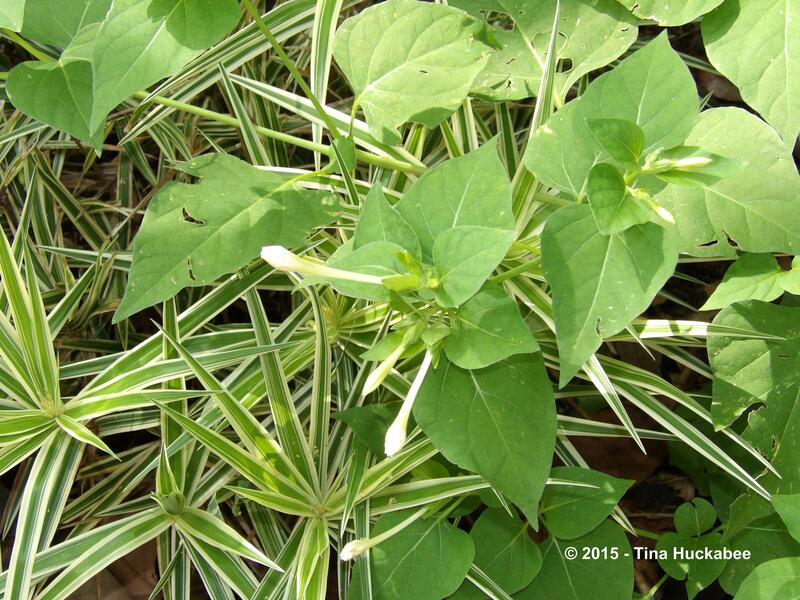 No matter – I am completely sold on the leaves as groundcover and the flower stalks are simply icing on that cake! It is a standout, blooming or not. Glad those darn deer have left if alone–they’d make a liar of me! It is a great plant, though you have to keep it in check, especially in a year like this which is so wet. It still spreads even when it’s dry, but the growing/blooming/spreading season will be more protracted with our rains. I’m happy that you’re happy! I really appreciate the green skullcap brings to the winter landscape. It has become one of my favourite plants around here. That and well … it is so agreeable. I want plants that will spread. Isn’t the leadtree pretty? I love the flowers but the shape and size of the tree itself is so right for small gardens. Great shot of the dog! He looks majestic. Agreeable. That’s such a great word and the Heartleaf is agreeable. And easy, which is one of the reasons I love it! I picked the leadtree because it is small and fits in that particular spot. There are trees that I’d love to have, but don’t have room for. Next garden. 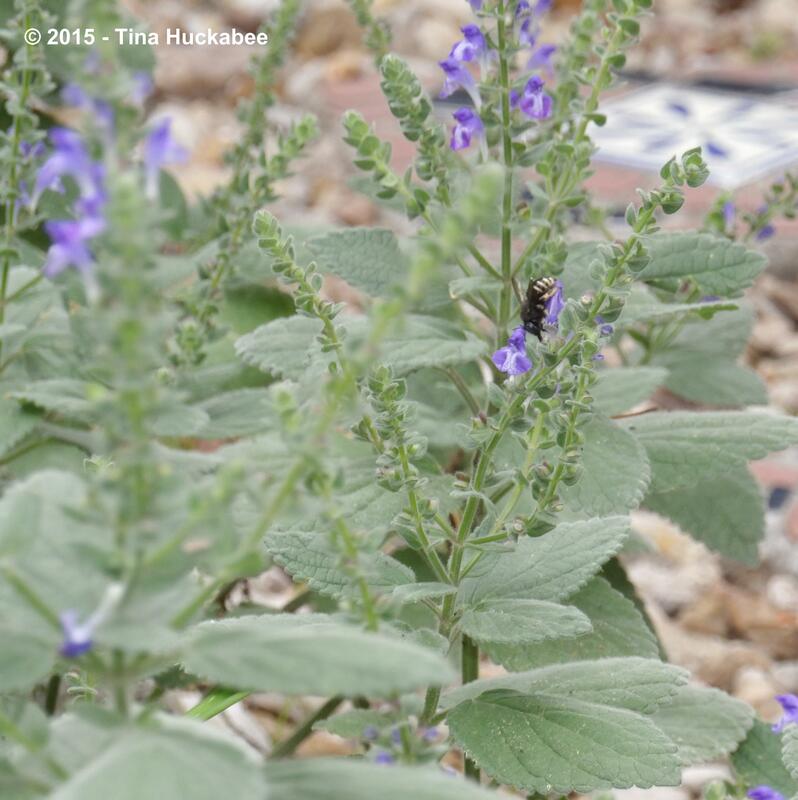 I love the Heartleaf Skullcap – both the soft, dusty foliage and the blue flowers. Great plant! It is beautiful and always a welcome addition to the spring/summer garden. It is loving the rain and there’s certainly been plenty of it! I hope your summer starts soon–you deserve some warmth and sunshine. 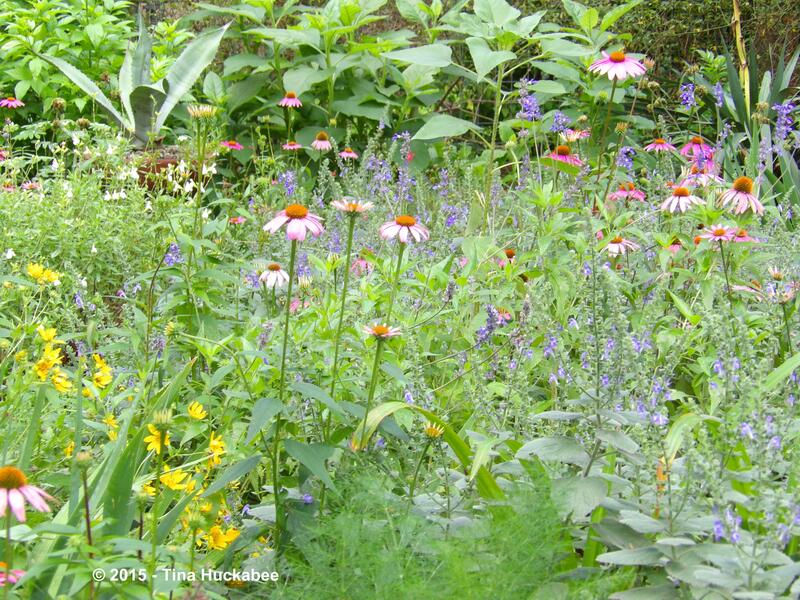 That’s a wonderful groundcover at the beginning of your post, and it looks great framing the Coneflowers. To answer your question: Yes! 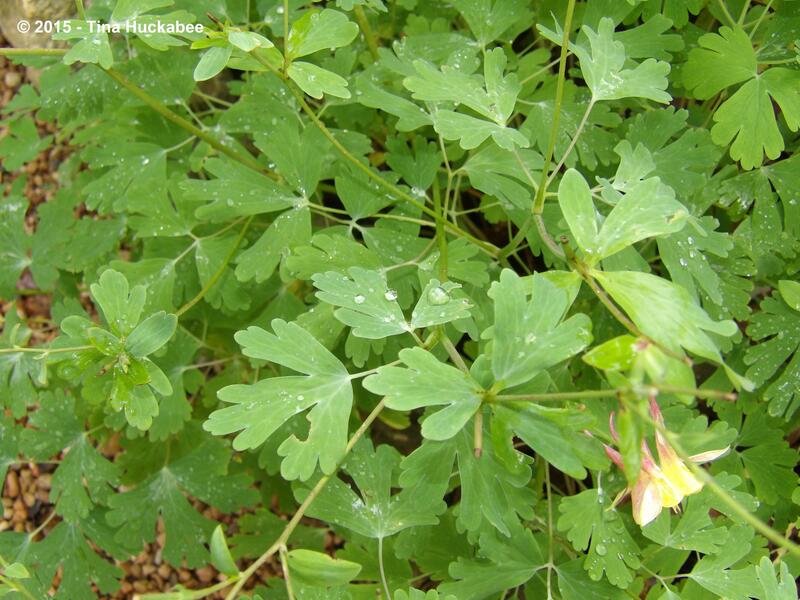 I love Columbines–foliage and flowers, alike. Plus, they attract hummingbirds. Win, win! Absolutely a win-win with Columbines–great plants all around! I see hummingbirds at mine, though they seem only to be checking out the blooms, not staying for long sips.